Is he PM Modi's most powerful weapon? Horrible accident near Mount Everest! Is ISIS responsible for Pakistan's Quetta attack? Julian Assange of Wikileaks arrested! Facebook plans to curb fake news! Washington sources reported that North Korea announced that it test fired a new tactical guided weapon on Wednesday that increased the "combat power" of the country's military. 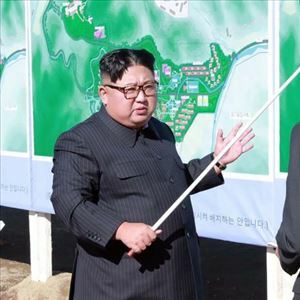 Meanwhile the state run Korean Central News Agency said the country's leader, Kim Jong Un, oversaw the firing of the weapon by the Academy of Defense Science. Washington sources reported that Satellite measurements by NASA researchers have verified the ground based data which shows the Earth's surface has been warming globally over the past 15 years. Reportedly the team used measurements of the 'skin' temperature of the Earth taken by a satellite-based infrared measurement system called AIRS (Atmospheric Infra-Red Sounder) from 2003 to 2017. Washington sources reported that Mr. Trump described the resolution as an "unnecessary" and "dangerous" attempt to weaken his constitutional powers. Meanwhile it is only the second time Mr Trump has used his presidential veto since he took office in 2017. Furthermore opposition in Congress to his policy on Yemen grew last year after Saudi agents killed the journalist Jamal Khashoggi at the Saudi consulate in Istanbul. Reportedly Indian expatriates across the United Arab Emirates (UAE) celebrated spring time harvest festivals and ushered in traditional New Year’s. Accordingly Keralites, the largest group among more than 3.3 million strong Indian community in the UAE, celebrated Vishu on Monday. Meanwhile Dubai resident Anoop Nair, who has released a Vishu special song called "Mama Malayalam"
Situated very close to the highest peak in the world, Mount Everest, the Lukla Airport located in the nation of Nepal has been attributed as one of the most risky and dangerous airports of the world because it has a very narrow runway. Los Angeles sources stated that with a dual fuselage design and wingspan greater than the length of an American football field, the airplane took off from Mojave Air and Space Port in California at 6:58 am (Pacific Time), said Stratolaunch in a statement. Reportedly achieving a maximum speed of 189 miles (302.4 km) per hour, the plane flew for 2.5 hours over the Mojave Desert at altitudes up to 17,000 feet. Islamabad sources reported that the Islamic State (IS) has claimed responsibility for the suicide attack at a vegetable and fruit market in Pakistan's city of Quetta. Meanwhile the militant group said in a statement on Saturday that one of its members carried out the suicide attack that killed and injured several Shiite community members and Pakistani troops. Kathmandu sources stated the popular multiplayer internet game PUBG has been banned in Nepal following a court order which said that it was having a negative effect on the behavior of children and youth. According to a media report the Nepal Telecommunication Authority (NTA) on Thursday directed all the internet and mobile service providers to ban PlayerUnknown's Battleground, commonly known PUBG. Following withdrawal of asylum status by Ecuador, WikiLeaks founder Julian Assange has been arrested by British police yesterday and has been removed from the embassy, which was where he was kept in asylum since 2012. As an attempt to tackle fake news Facebook is going to bring down facebook Groups involved in sharing false and misleading information by reducing the news feed distribution of the facebook Groups. The admins who manage and administer the fake information sharing groups will be made accountable for the gross violation of Community Standards. Reportedly Wreckage from a Japanese F-35A stealth fighter jet has been found a day after it disappeared off the radar over the Pacific, the country's defense minister said on Wednesday, 10 April. Defense Minister Takeshi Iwaya said “There was no word yet on the fate of the one pilot on board the jet”. He told reporters "We have collected part of its tail" in search operations at sea with planes and vessels”. Is ISS littered with microbes just like in a gym or office on Earth? Is Trump determined to pursue a hard line? Reportedly President Donald Trump went to the Mexican border to deliver a message to would be illegal immigrants: the United States has no room left to take them. Meanwhile Trump sees his campaign against a "crisis" on the border as key to his 2020 reelection bid, and his trip to Calexico in California was meant to keep that message in the headlines. Why Pope Francis issued warning to US President Donald Trump? According to sources Pope Francis has issued a warning to US President Donald Trump and other political leaders, saying that those who close borders "will become prisoners of the walls that they build." Pope told reporters aboard the Papal plane in response to a question about Trump's threat to close the US Mexico border "Builders of walls, be they made of razor wire or bricks, will end up becoming prisoners of the walls they build". Why Rich Nigerians order Pizza from London? According to sources from Abuja Nigeria's minister of agriculture, Audu Ogbeh, complained in his country's parliament that super rich Nigerians order pizzas from London and get it delivered by British Airways the next morning and hence the startling "revelation" surprised one and all. As per report on a barren hillside in northern Albania lies a portal to the country's communist past where a massive steel door creaks open to reveal a hidden former air base burrowed into the heart of the mountain. It is made up of 600 metres (1,980 feet) of tunnels that once teemed with military life, the secret Gjader air base is now a depot for dozens of hulking communist era MiG jets collecting dust in the darkness. Is Jeff Bezos Smartphone be hacked by Saudi Arabia? Washington sources reported that veteran security consultant who works for Amazon Founder and CEO Jeff Bezos has accused Saudi Arabia of hacking into Bezos' smart phone and alleging sharing personal information about his extra marital affair to a media outlet. Meanwhile the monarchy was "intent on harming Jeff Bezos " over The Washington Post (owned by Bezos) coverage of murdered journalist Jamal Khashoggi. Why Trump take actions cutting aid to 3 Nations? London sources stated that according to the Skytrax World Airport Awards Singapore's Changi Airport has been crowned the world's best aviation hub for the seventh time in a row, while New Delhi's Indira Gandhi International (IGI) Airport featured at number 59. Meanwhile the list has been compiled by the UK based Skytrax, a consultancy firm which runs an airline and airport review and ranking site, featuring 100 airports. Will Pakistan face lot of economic problems because of India? Opposing EC will trouble CBN! Bharatiya Janata party leader GVL Narasimha Rao lashed out at Andhra Pradesh Chief Minister N Chandrababu Naidu on his poor and disrespectful responses to the orders issued by Election Commission of India. He said that Chandrababu Naidu's rude and arrogant behavior against the EC was notches above the behavior of West Bengal Chief Minister Mamata Banerjee exhibited against CBI.